Reviews - CDs, Venues, Bands and more. Based in SE Georgia, Cole Tomlinson is an energetic country music singer with a stage show that charms the audience and showcases talent beyond his years. Wowing audiences with his genuine southern boy charm, easy going demeanor, and solid country sound, Cole has audiences on their feet and eager to hear more. A south Florida native, Cole has also lived in Texas and now calls Georgia home. Cole began singing at age 3 in churches across the South with his singer/guitar player father. As his confidence boomed he began seeking out his own music and experimenting with a variety of musical instruments. He continues to sing Southern Gospel, Contemporary Christian and Bluegrass but has turned the focus of his career to Country Music. Cole has participated in and won several talent and music showcases and school productions. Besides music his passions include football (GO DAWGS!! ), wrestling, RCX, and fishing. Cole has been a finalist in Teen Artist of the Year for both 2015 & 2016 in the Georgia Country Awards. 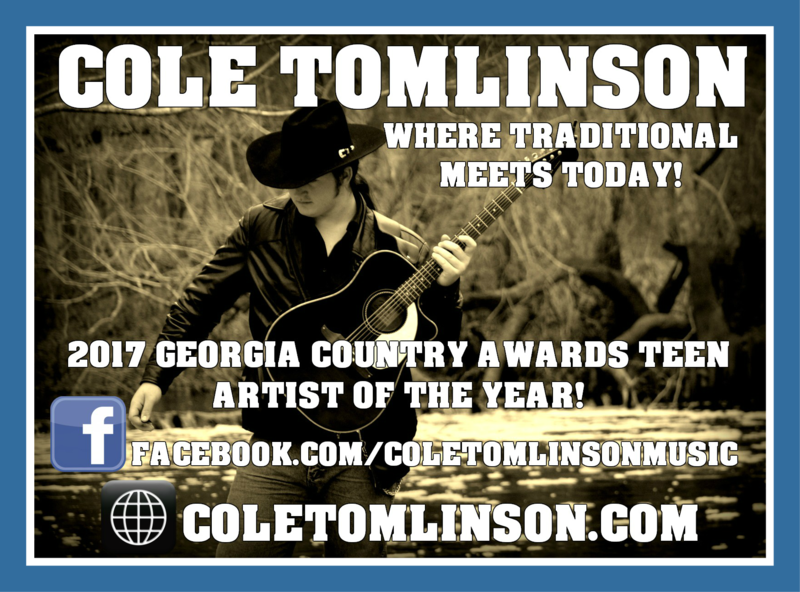 On Nov 10th, 2017, Cole won Teen Artist of the Year in the 2017 Georgia Country Awards. He currently is in the running in the Nash Next 2018 contest and 2018 Josie Music Awards. Cole also performed many shows in the 2018 CMA Fest in Nashville. On August 25th, Cole won three awards in the Georgia Gospel Country Bluegrass Association Awards; New Country Artist of the Year, Instrumentalist and Entertainer of the Year, in the 13 to 16 year old categories. GC: Cole, lets get Georgia familiar with you. Where were you born, raised and about your family life today? CT: I was born near the Florida Everglades, lived in Texas a couple of years but have spent most of my life in Southeast Georgia. I'm the youngest, my brother is a US Marine and my sister a Corrections Officer. They are both married with families and I live with my parents in Blackshear, GA. I attend Pierce County High School where I am finishing my junior year of high school and first year of college. I play defense on my high school football team, throw shot put and discus with the track team, and am a 4H Teen Leader in my county. GC: You've been singing since early on. What was the first time you sung in front of an audience and what song? CT: I sang in church when I was 4 , a song I learned for my Poppa called "Crying Holy.' He bought me my first guitar when I was born and I had listened to him and my daddy both sing and play. After than I started singing in churches with my dad and still play at my home church when I'm home on Sunday's. When I was 12 I started playing at state and county fairs and competitions. Within a year I was getting call's to play in a variety of venues, acoustic sets from 2 to 4 hours. GC: For someone still in your teens, you've already had great experience in the music business. What ONE thing would you say has been the most important thing you've learned so far? CT: Never stop learning. I have played with some of the greatest musicians and they all tell me the same thing, practice daily and never quit learning as much as I can from everyone around me because in the end it's not about being the best or knowing the most, it's about using your gift to its fullest. GC: Now, with a band, you're playing more and more places. What is your favorite place to play, solo or with band? and why? CT: I've played some pretty awesome places across the Southeast and to Los Angeles. I can tell you something great about all of them but my favorite place to play is always the Spirit of Suwannee Music Park in Live Oak. I have played there solo and with a band over the years. It's just a special place and when you're there the history and music just seems to surround you. People who come to the events there are music lovers and for a musician that kind of audience just can't be beat. GC: You started your band this past year. What was the hardest part about putting together a band? CT: Getting people to look past my age. I've been performing on country music stages for over five years and did over 150 shows a year the last 2 years. I play more than ten instruments, write my music and compose the music on each instrument for my originals we play in the band. When I cover a song I make it mine. Finding people who can do that with me and not mind when a 17 year old tries to teach them something hasn't been easy. I interviewed dozens of people to start and have changed people out over the last year and a half. My bass player and lead guitarist right now are multi-instrumentalists, my lead guitarist has been my main drummer since I started the band. GC: What ONE piece of advice would you give any PRE teen about the music business? CT: Never listen to anyone else's opinion about you. If you are focused on learning all you can about your art and constantly striving to improve, what other people think about you isn't important, the good or the bad. It's just their opinion. I think for young people it's easy to take stuff to heart and either get a big head or get discouraged. I just do what I love and God has called me to do, let everything else fall into place. GC: With us now in 2019, what is your goals for this year? CT: I am finishing up my first EP to release this year. The first single will be available soon. This year I am also participating in more songwriter rounds and events across the south and will be doing a fair run in the Midwest in early summer. I'm just getting my music and sound out to as many people as possible. © 2010 - Georgia-Country.com All Rights Reserved. Site Design: DaLee & Company, Inc.